Our original Shield logo in all new "just for girls" shirts!! These tees are the bomb! Featuring new sheer cotton jersey fabric -- lightweight and stretchy for a perfect feminine fit! Soft and comfy shirt stock from American Apparel with raglan cap sleeves and merrow stitched boat neck styling. 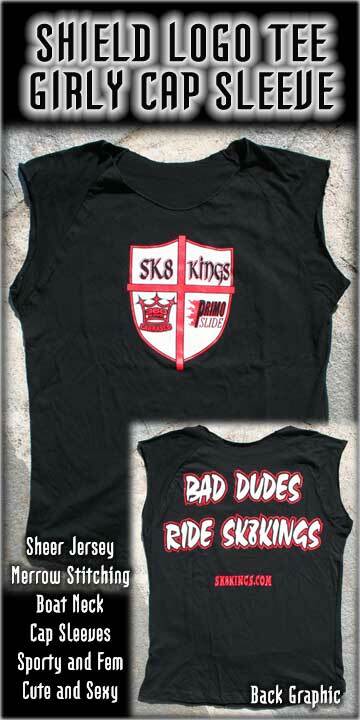 Silk screened Shield logo is front and center and the back declares "Bad Dudes Ride SK8KINGS". Available in two sizes -- medium & large - black only. Be sure to check out our "Girly Tees" category for a look at all our logos in both cap sleeve and 3/4 sleeve styles.